While I was standing at JFK airport watching the athletes walk through security on the way to board their flights, my excitement for the European Maccabi Games really began to build; Everyone scheduled to arrive today has arrived safely. As we drove through Berlin on our Panaromic tour, ending at Platform 17, where thousands of Jews were deported to various concentration camps, for a Yizkor service, the true meaing of the European Maccabi Games became apparent. We are making a strong and significant statement by being part of the largest gathering of Jewish people in Germany since the Holocaust - We are strong, We are proud and most importantly, We are still here. As our athletes read the names of the murdered Jewish Olympians from the Holocaust and the Munich Olympics in 1972, you could feel the raw emotion of the entire delegation. The wind was blowing, but everyone was listening. All the athletes and supporters enjoyed lunch together at the Kanteen Deluxe restaurant in Berlin and the mood was joyful. After a long day of travelling and touring, everyone was excited to get to thier hotels, check-in and rest for a while. Team USA had a great dinner with the Maccabi Great Britain Delegation and everyone is excited for the Games to begin. In the next couple of days we will train and compete while strengthening our Jewish roots as we explore the history of our ancestors. It has been a privelege and my pleasure to serve as the Maccabi USA Chair for these European Maccabi Games. I look forward to the upcoming competitions and seeing the athletes bond and form lasting relationships. Please stay tuned as we keep you up-to-date on what we are doing over the next 10 days. The Opening Ceremony will be streamed live beginning at 2:00 PM EST/11:00 AM PST on July 28th! Please click HERE to see the live stream. Tweets from our followers about EMG! 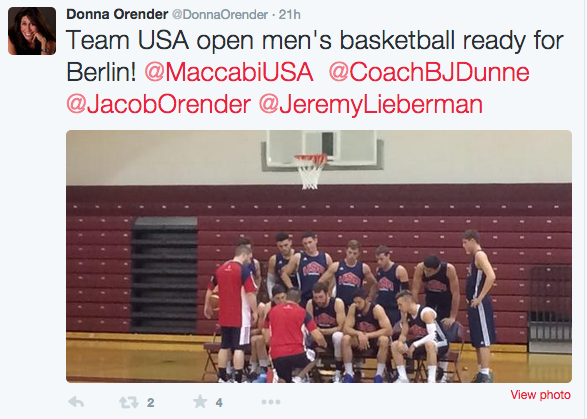 Don't forget to tag @MaccabiUSA and use #TeamUSA and #EMG2015 when you are using social media during the Games!